The nationwide implementation of smart metering systems in Norway is proceeding steadily. For Aidon this means an increasing order backlog: Skagerak Nett on the south-east coast of Norway is the 4th large energy distribution company having selected Aidon’s technology for their AMI solution. Aidon will act as subcontractor for Ericsson which won the contract for the total delivery to Skagerak Nett. Aidon’s part of the project covers the central system for meter reading, the low-power radio based communication solution and 180,000 Energy Service Devices to be installed to Skagerak Nett’s customers. The project contract was signed on the first week of May. The introduction of the new system will start in the end of 2016. – Being selected as the AMI technology provider for this project is a strong sign of trust in our technology and in our competence. Our solution gives the required flexibility and capacity for developing advanced smart grid functionality while providing a reliable platform for remote meter reading. I’m very pleased about the good cooperation with Ericsson during the tendering process and look forward to a successful implementation project, says Thor-Erik Næss, Managing Director of Aidon in Norway. – Aidon was a natural choice when we evaluated potential suppliers for our solution. The combination of a forward-looking communication solution, good adaptation to the technical requirements set by the Norwegian regulation as well as focus on future smart grid functionality were important elements in the evaluation. We have very positive experiences of our cooperation so far, and look forward to continuing the cooperation during the project period, says Aksel Aanensen, Head of Ericsson Norway, says Aksel Aanensen, Head of Ericsson Norway. Since February 2014 Aidon has signed large-scale AMI contracts in Norway with Lyse Elnett, Eidsiva Nett and Hafslund Nett. In addition, smaller local energy distribution companies Klepp Energi, Jæren Everk and VOKKS Nett have selected Aidon as their AMI technology provider. In total, Aidon’s order backlog for Norway is more than 1.2 million metering points. 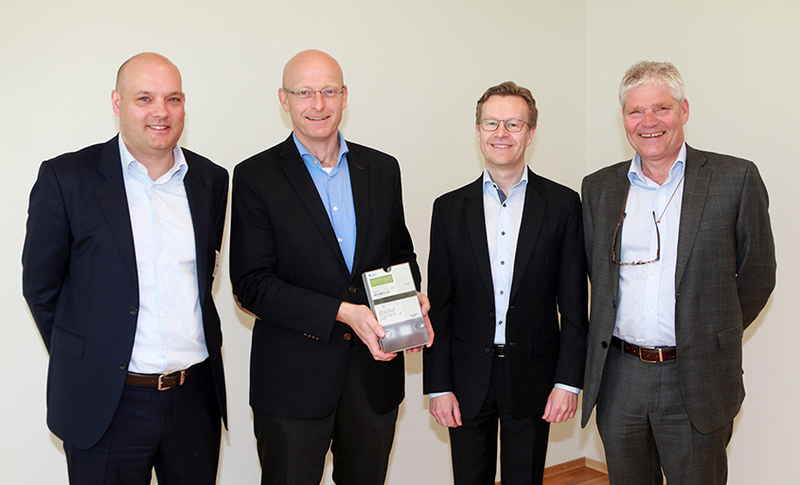 From left: Ronny Brudeseth, Eltel Networks, Geir Kulås, Skagerak Nett, Aksel Aanensen, Ericsson and Thor-Erik Næss, Aidon.